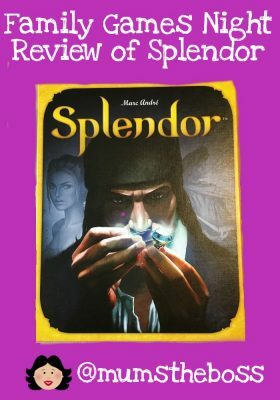 This month’s board game is Splendor by Marc Andre. 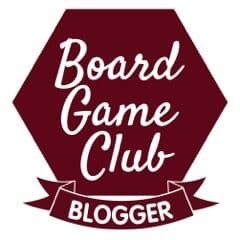 I am a proud member of the Asmodee UK Blogger Board Game Club. They send me regular board games to review with my family – and we do our best to give them a good try out. 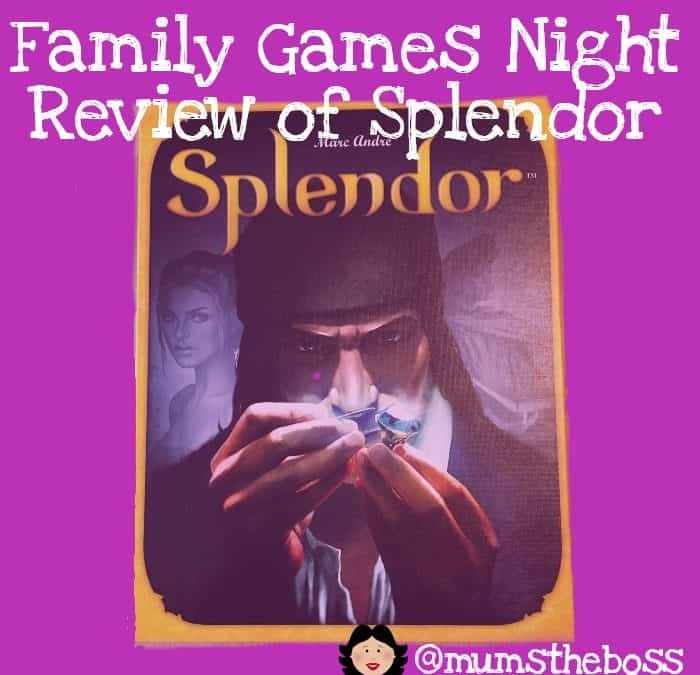 Here is what we thought of Splendor. On the face of it this game looked to be right up our street. 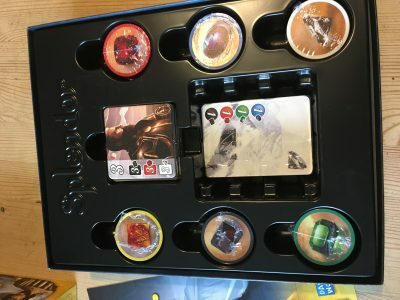 It has great reveiws on my husband’s favourite site boardgamegeek, and gets a rating of 7.5 out of 10 which is pretty good. The premise of the game is that the players represent wealthy citizens trying to build prestige in the Middle Ages. They trade in gems, use the gems to buy more and more precious things, and hope to secure the patronage of a noble. This sounded like a lot of fun. The box is nicely packed and the game looks simple. The game pieces and cards are beautifully illustrated and the gem counters have a bit of a shimmer on them and feel expensive, like proper gaming chips. The initial set up is intriguing and the rulebook is just four pages long and pretty straightforward looking. So off we went. 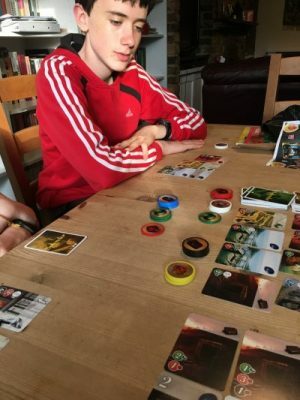 I don’t know whether it was just a rainy half term afternoon, or me asking two tired teenagers to play a game when they didn’t really want to, but very soon into the game we all started to feel a bit flat. We reread the rules to see if there was anything we had missed but it seemed like we were doing it correctly. We were buying the gems and buying the properties, but nobody seemed to be having much fun. Each turn is very short – you do one of four things – and there is no interaction at all between the players. The turns were so short that we occasionally lost track of whose turn it was next and none of us could remember who had played last. We were all a bit tired, but we play a lot of games and usually we get caught up in the story of the game and start roleplaying and sparring with each other but that didn’t happen at all. It felt to me a bit like the card game rummy, where everybody draws a card and then discards it, until somebody randomly says that they have won. We could see by the points accumulating on the table in front of us that my daughter and son were doing slightly better than me, but they didn’t seem to be able to block each other’s moves or do anything about which one of them might win, and I had no idea how I might catch them up. There was a small amount of tension towards the end of the game when it seemed clear that my daughter was going to win, and my son and I managed to hold back the inevitable for a further two turns, but at one point we questioned whether we should even try and prolong the game any longer than it needed to be. But we are seasoned game reviewers so we plodded on, but even at the end of the game after the tension resolved and my daughter did indeed take the crown, we all three agreed that it just hadn’t been very exciting. So my children have voted the game a big thumbs down. I was a little bit sad at this. The game has been nominated for several awards and a lot of folks on boardgamegeek really like it. So I had a look a the reviews to try and figure out why it missed the mark with us. Everybody agreed it is quite an intense game, and not one that fosters much conversation – a bit like chess. That’s great for some types of gamers, but that’s not really why my family plays games – for us the chat, rivalry and family interaction is all part of the fun. This may suit young adults better or people of the same age. 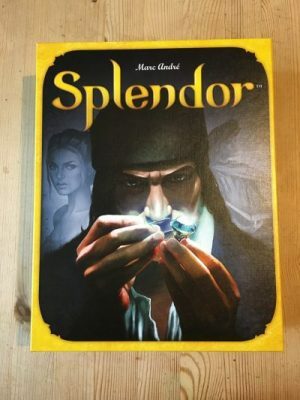 One review of Splendor was quite revealing – they reckoned that the 2 player game is very interesting because everything you do directly impacts your opponent, and the 4 player game is interesting because resources become scarce and so you have to keep an eye and hoard resources carefully, which needs a bit of strategy. 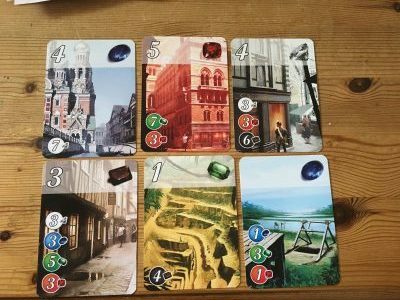 But that reviewer concluded that the three player game was a kind of hybrid between the two and had neither of the attractive features of playing with 2 or 4. So that may have been part of our problem. It also seems like this game gets better as the players get used to it and benefits from regular playing. So you develop a strategy, and then your opponent works out how to thwart that strategy so you have to think of a new one, and so on. 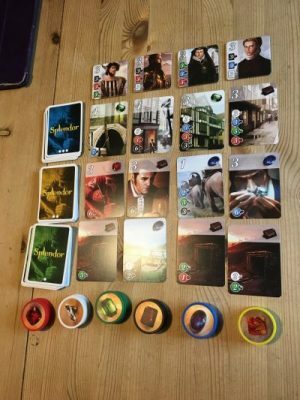 So I’m not going to give up with Splendor. I’m going to try it head to head with my husband a few times and see how we get on with it. Sadly I’m on a deadline to write this review so I can’t report back how we feel 10 games later just yet, but watch this space…..